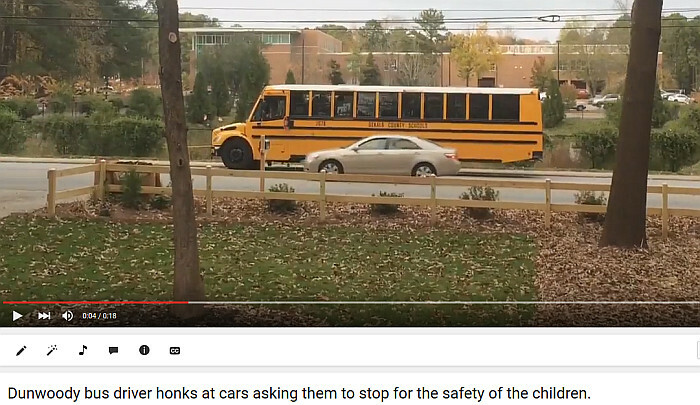 Heneghan’s Dunwoody Blog: Dunwoody residents are demanding slower speeds & school bus enforcement from Dunwoody Police Facebook page. You may recall I travel by motorcycle wherever I don't walk. I pay a lot of attention to what other vehicles are doing because they mostly don't see or acknowledge me. 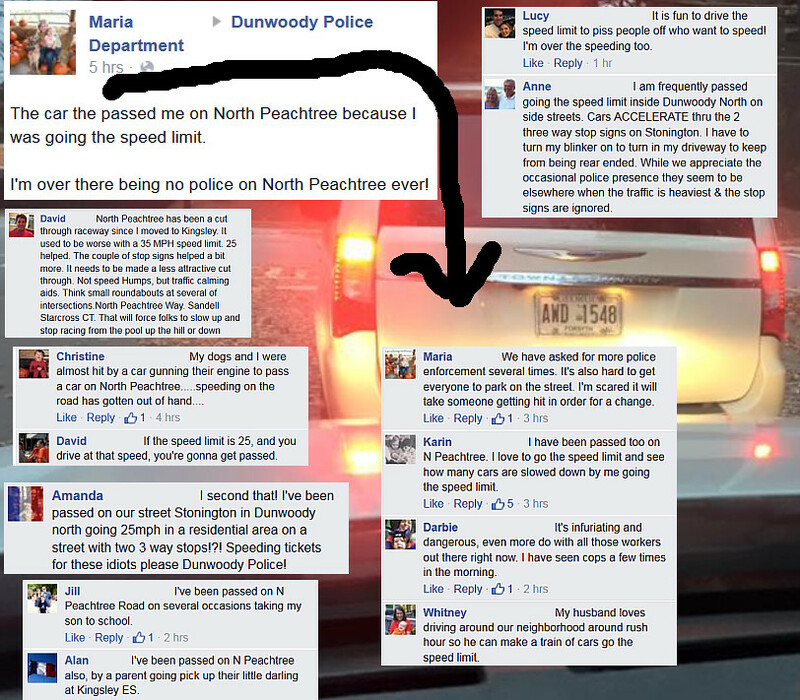 Speeding is a problem all over Dunwoody. I have learned to avoid most of Dunwoody North, especially North Peachtree. I also stay away as much as possible from GPC and that end of Tilly Mill. GPC traffic, commuters, and locals all seem to get in on the game of rushing from place to place. I spent a lot of time the first few years Billy and his officers were on our streets communicating problems I observed to him, asking questions about coping mechanisms specific to my modes of transit. He has been terrific in that regard. He used to ask if all the sirens I began hearing on Ashford Dunwoody Road bothered me and I told him I cheered every time I heard one of his officers pull someone over. I don’t hear them nearly as often as I once did. While it is true that commuters and GPC students often drive without regard for setting, speed limits, stop signs, etc, a plurality if not majority of locals do likewise; at least in subdivisions not their own. I have lived on Valley View Road for over 16 years. We moved in right after the speed tables were installed. One of my entertainments over the years has been to watch the speeders get airborne and bottom out, raising a shower of sparks. I've even seen a Dekalb Police cruiser do it, though to their credit they were chasing someone. I fear traffic calming measures like the speed tables may be the only thing that helps, and as I’ve observed, many speeders will continue their behavior without regard to their own safety or vehicle integrity with this measure. Some parts of Sandy Springs have chicanes and rough raised paving stones at stops to slow folks. It might be worth asking them if these measures have been effective. I suspect they are expensive, but so are injuries, deaths, and vehicle collisions. While we’re at it, a more deadly problem that seems to be spreading is folks rolling through stops. I suspect many of the same folks who regularly speed through Dunwoody also engage in this behavior. Some days it feels like I’ve had more close calls from folks inadvertently trying to run me over having run a stop sign than I’ve had hot meals. This behavior is not limited to Dunwoody, but it is especially acute; and it rubs me the wrong way given the frequent complaints from folks about poor, unsafe driving habits here; often from the same folks who then engage in said habits. If I can be of help with regard to traffic calming, speeding, or running stops, please do not hesitate to let me know what I can do. I think the process to get traffic calming measures passed is overly burdensome, and errs on the side of keeping things the way they currently are. As many may know, to commence the process to request calming a study must be conducted that demonstrates a need for calming. To request a study, "initial interest" must be shown. "Initial Interest" is established when 20% of the affected families request a study in written form. The Stonington study was conducted on a non-school day (why I am not sure), and did not demonstrate a clear need for calming. Despite this fact, the city pushed forward and offered solutions. To enact one of these solutions required a 65% written buy-in from all affected households. A consensus of this size is challenging when there are multiple solutions presented, and the burden on community volunteers is substantial with regard to the efforts that must be undertaken to effect change. Almost everyone agreed that something should be done, but the "how" of the solution was the source of contention. As such, the effort stalled, which is what I think the city counted on in the first place. I am disappointed to hear that this still remains an issue, but until there is a tragedy on Stonington and North Peachtree, I suspect that there will be minimal action. Pat and I are less daring than most of our neighbors when it comes to letting our kids ride their bikes or walk between neighborhoods because of traffic speeds. My friends joke that I drive like a little old lady. They're right - I want to live long enough to be one! I drive on N Peachtree for some length almost every day. A couple of notes to include w/ the consideration for improvements, for whatever they are worth. 1) N Peachtree from Mt Vernon or Tilly Mill to Kingsley Lake is a steep grade. Gravity alone can get your speed up to 50 MPH and I have to ride on my brakes to maintain the 25 MPH speed limit. (My mechanic who checks my brake pads every other month can confirm.) The new permanent speed monitor on N Peachtree is a help but it can't do the job of slowing down traffic by itself. 2) It's easy to put all of the blame on cut-through traffic on commuters passing through Dunwoody on the way to the Perimeter, or GPC, etc. We have to face the hard truth that it's not all from out of town. Some of our Dunwoody neighbors - teens and mature adults alike - have a sense of entitlement that goes with thinking that the law is whatever they want in their own front yard, including a speed limit at their convenience. (I decided against the sentence involving "jackasses".) Bad driving and scofflaws are not just functions of commuters from outside of our borders. 3) With that said, commuters do make up a segment of the problem of speeding and cut-throughs and I've been saying for years that our commuting destinations (GPC, major perimeter companies, local shops where commuters end up like drive through restaurants and gas stations) should be approached as potential partners in communicating to the commuter element, "Drive Friendly in Dunwoody" with an unspoken "or else". Still waiting to see that idea get kicked around a little more. By the way - did anyone run that plate number that was captured in the original facebook post used on the graphic? I agree that not all speeding traffic in Dunwoody is cut through traffic. Unfortunately local residents are guilty of this as well as those who commute through Dunwoody. I had to remind a lady this morning driving through the parking lot at DES during carpool to slow down. I think the lady was confused and thought that she was on Talladega Raceway!! The passing of stopped school buses is what worries me the most. I have personally witnessed cars flying past a stopped school bus on Chamblee Dunwoody Road and also the middle school bus on Womack is passed by numerous cars every day. I agree with the above 'Drive Safe in Dunwoody or else' being communicated more! I was actively involved in the 1990's efforts to establish traffic calming measures on Stonington and I can attest to the length of process and the many hoops through which we had to jump. We were seeking speed humps, no-turn signs, and more stop signs. In the end, we got two whole stop signs. This was, of course, before the City of Dunwoody, so hopefully any future efforts will be more straightforward. Also, as a frequent walker, I cannot count the number of instances when cars run straight through our stop signs on East Kings Point and Brookhurst as they are headed to Stonington. These cars are not neighbors. Enforcement of the measures we already have in place could go a long way toward discouraging - or just slowing down - the clever commuters who love our shady streets.